One can consider feeding their body five to six times a day. Eating every few hours supports your metabolism and provides necessary energy to get through your workouts. Try to consider eating at least 1,200 calories a day. Any intake under this can limit your necessary energy levels to get the most out of your workouts. Workout intensity will decrease which will lead to lower fitness levels and decreased weight loss. Low calorie intake can make your body think it is starving and twist your metabolism in the opposite direction. Snacks should be considered on average to be about 100 calories or less. This can increase if necessary. If to much of an increase is needed for energy, you should consider that snack a meal and adjust your meal plan for the day. Stay hydrated!! Consider drinking at least eight glasses or 64 ounces of water a day. If sweating a lot or it is a hot environment, drink more if necessary. Water is very valuable because it has zero calories, keeps you satiated, and helps flush out toxins from your body. Try to avoid to much intake, if any, of juices, flavored waters, and other high calorie drinks within your day. BREAKFAST: Within an hour of waking up. SNACK: Two to three hours of waking up. DINNER: Two to three hours after snack. Eat at least two to three hours before going to bed. Just because it says "low-fat" or "fat free" does not mean you can or should eat bigger portions of it, these products are still sometimes filled with ingredients that have little or no nutritional value. And, the calories still add up. Fat Free does not always mean calorie free. Do not get tricked by single serving foods, some single serving foods are broken down into multiple servings to hide calories. 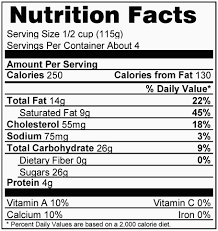 Be cautious and aware of saturated fat, trans fat, cholesterol, and sodium percentage. Limit these nutrients to decrease health risks. Fiber helps digestion and promotes regularity, important ingredient to be aware of. Sometimes Fat-Free products have an increase in Sugar and ingredients with little nutritional value. Drink water or other calorie-free beverages when you are thirsty. Soda and other sweet drinks contain a lot of sugar and are high in calories. During workouts, especially extended or intense workouts, Sports Drinks(Gatorade or PowerAde) are a good alternative to water.